Share the post "The White Men"
After the intermittent rain showers we received most of the day, it’s looking to be a very pleasant rest of this summer’s evening. Thank goodness the wind changed to the north with its cool and drying air. Living in the flatlands, allows for us to experience all the more, those cooling winds from the north. In spite of having to endure rare storms like Monday’s, I’m still glad to be living in North Iowa. Looks like it’s going to be days before all the felled trees and brush is cleared away. Most of my day was spent working on files and showing homes. One of my showings was to a gentleman whom I’d first met upon arrival at a property. He’s a transplant from one of our Southern States who’s been very impressed by what Mason City has to offer. He was transferred in by one of our area corporations some months ago, and is now looking to make a more permanent commitment to our community. His matter of fact approach to conversation was very refreshing. He’s ex-military which also meant he was addressing me in a more “military” fashion which caused me to inwardly smile. It’s unfortunate that the general public don’t address each other in such ways. His needs are simple, but expectations high. The big “want” of his, is to be living in a relatively safe neighborhood. He summed it up by saying, “I’m a country boy at heart, and I’m not the least bit interested in having drug or crime related issues with my neighbors.” With those words, I was pretty much put on notice to place him in such a district. My appointment out of town gave me another opportunity to see the countryside. What surprised me the most, were the number of un-planted fields. I hope they’re waiting for beans instead of being too waterlogged to plant corn. Likely because I’ve been plagued with tree issues, I paid special attention to all the trees in groves, dooryards, and acreage driveways. I’d say Worth and Winnebago Counties have more mature oak trees than other varieties. I also noticed all the more European Buckthorn growing in abundance, which reminded me of my buckthorn stab I received while handling one of their branches on Sunday. That thorn went right thru my yard gloves and deeply pricked my middle finger. Ouch! Knowing it really got me, I took my glove off and noticed that it actually hit a vein which was spewing a copious amount blood. I washed it off and taped it so to keep it from bleeding. We should first educate the citizens of North Iowa, and then create an appropriately armed weekend warrior posse to eradicate them. What do you think? 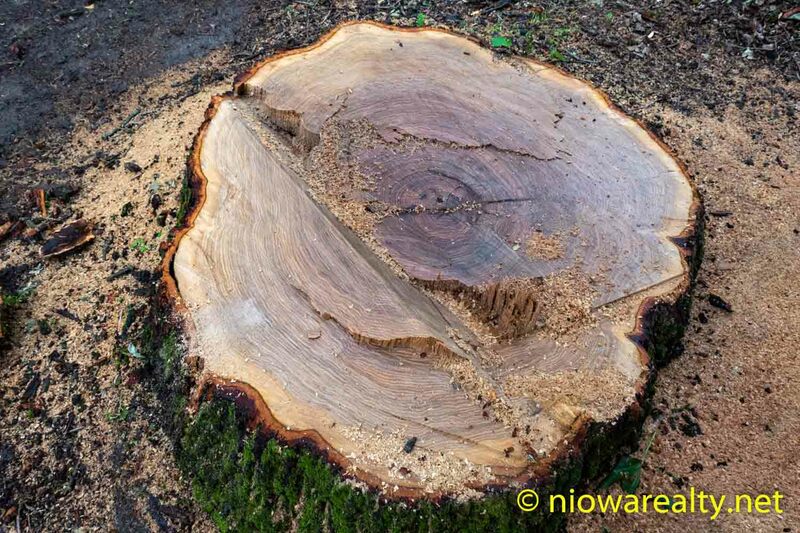 The above photo is of the stump of a white oak tree that was cut down in our City. It made me very sad after having counted well over a 100 rings and not yet being halfway to the center, which meant it was certainly in the 200+ year-old range. It wasn’t sick or dead, but creating too many safety issues with falling branches and limbs from storms these past years. I measured its stump, and it was four and a half feet across! He was indeed a big boy. At one point in its early life, there could’ve possibly been a native indian resting under its branches long before the white men started carving out homesteads in our State. Oh, if only that tree could’ve spoken. Can you imagine the tales it would’ve told? Tonight’s one-liner is: If equal affection cannot be, then let the more loving one be me.